I did exactly the same thing with my bartop. 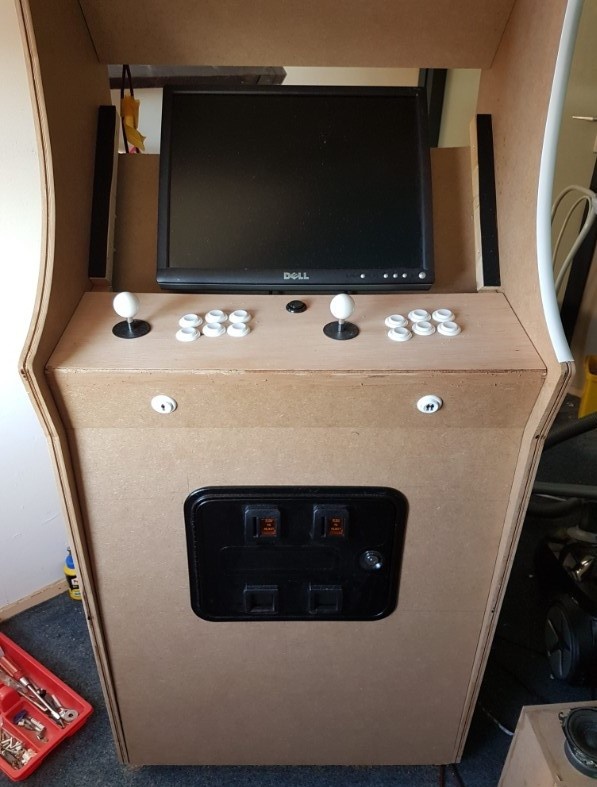 What I did to fix was get a couple of pieces of hardboard, cut them to size to fit the routed out square, glued the crap out of them used some clamps to hold tightly, waited a day for glue to set and then redrilled the joystick hole. I undermounted with inserts and had no problems at all. Thanks, I will try that later. I am also considering getting 12mm plywood for the control panel. No need to route then. I would suggest cutting a new CP. You need to learn the quirks of your particular router. That way you won't have the same problem on future projects. Consider it router training. You would advice against a 12mm panel? I thought some people recommend using 12mm (1/2") plywood? I don't advise against it. It will work fine. I just take every opportunity to use my routers. They can be ornery beasts. The more you use them the better off you are. If you have the opportunity to use cabinet grade plywood for your CP - I recommend that over 1/2" MDF. It will be much stiffer. You won't find it at a box store however.. I woodworking supply store (like Woodcraft) will have a selection. Nice design and nice Sketchup work! The free version of Sketchup should still be out there. Are you using Pro features? FWIW: My CP is 5 deg down. If you can - don't finalize your angle until you test a little bit. I did a mockup of my setup on the bench and experimented quite a while to get something comfortable. Woodcraft is a great store. I took a woodworking class at a Woodcraft store a couple of years ago. I worked at one (part time) for ~7 years.. Spent way more on tools than I ever made there... Really a great place and the people know the products. Yup, I was planning on plywood for the control panel (currently it's MDF). I'm in the Netherlands and we have some options to order (custom cut) board in all kinds of quality. I used the free (online) version of Sketchup. Then when I needed the Pro features (such as textures) I downloaded the free trial of Pro (30 days fully functional). If I need it again I can always re-install my laptop to start a new trial. I don't use it that much to justify €600 for a standalone license. 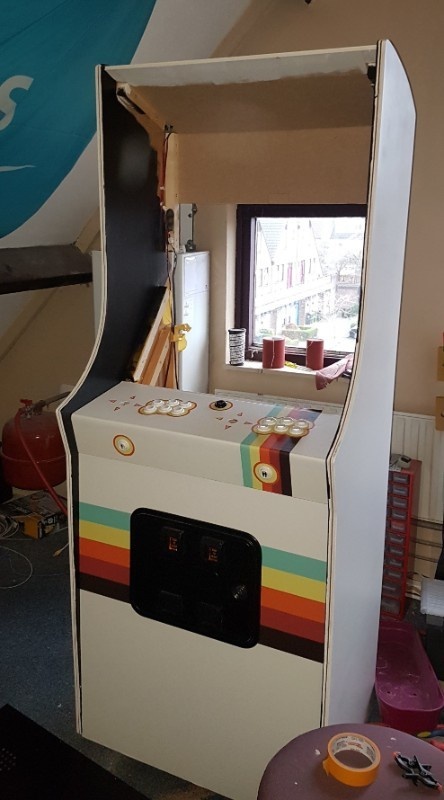 I lifted the cabinet about 3cm from the ground as I want to place wheels in the back like in this build: http://forum.arcadecontrols.com/index.php/topic,141846.msg1468043.html#msg1468043 and to make some room for of course some shabby led strip on the bottom. I just started my build based on your cabinet. I did some streetfight side art for it. Drew some inspiration from another street fighter build here. I screwed up one side cut though and had to wait till this weekend to go pick up another sheet of mdf but it hasn't stopped raining. MDF and water don't go well together lol. I should be able to salvage some of the other sheet I messed up my cut on for other parts. Pretty excited I'm gong to have a full size cab now. I was going to destroy my bartop but maybe post a listing locally if anyone wants a bartop shell. I'd hate to destroy it. I'm really looking forward to your progress. I hope you'll be a bit faster than I.
I need to since wife uses garage to park her car in and have another car in other side so doesn't leave much space to store it between builds. So need to get cabinet done fast, sand, prime and move in doors and put in the guts from the bartop. Hope this weekend I can get pretty far since after the side I messed up is the harder part..the rest is just square cuts. Hope to get all parts cut today and start assembling tomorrow. Want to put wheels too. I have some that go in back so you can tilt back cabinet and roll it. Not sure if I'll use those though. And we added the screen. Took me more work than expected, but managed to use some plate the screen clicks in that was in the stand. Fix a corner where I routed away too much wood. Find a way to properly fasten the control panel, but as almost the whole back can be removed I might as well just permanently fix the control panel. Order and fix the marquee + leds. Get all the electronics in. Create a theme for whatever I will be using as frontend, based on the art. I'm hoping to get mine done so I can sand, prime and paint to get it ready for the art too. I still need to get a coin door though. :-( Going to go pick up primer and black paint today and have it ready. I'm going to make a slight change in your design to the top marquee, speaker and bezel. In the end I made some changes as well. Just make it to your own likings! And I added switches to the coin door return buttons so they can act as coin buttons for free play. That looks really smooth! Is the plexi still transparent enough to have a backlight illuminate the marquee? Where did you get it? So far the only services I found were hugely expensive and/or only used to print portraits etc. thus had only photopaper-like dimensions. Works perfectly fine! Lighted with one led strip (warm white) from the underside. Got it through a guy from Tweakers.net. I can provide you his e-mailaddress if you want. Their website is getting rebranded. 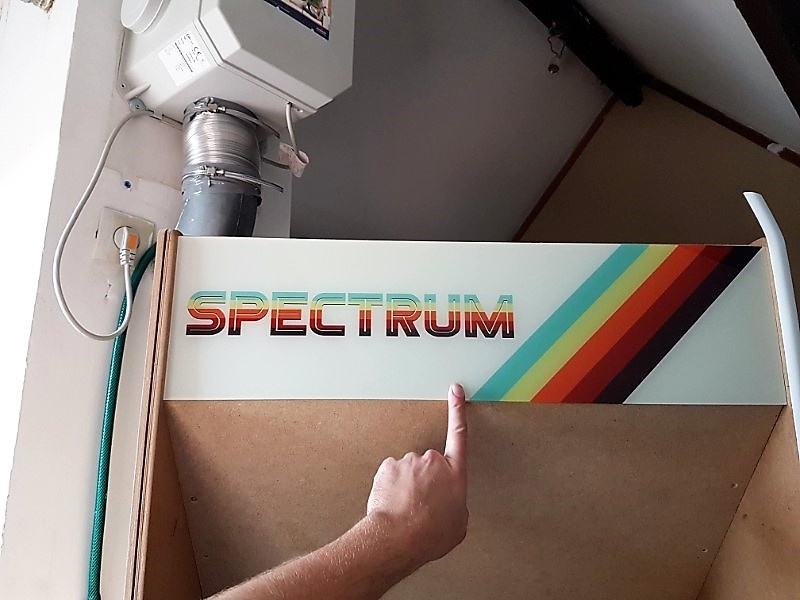 Please tell me you're going to be able to play ZX Spectrum games on this! Who did you order the artwork from? The marquee looks fantastic. Nice Marq brotha! I like the name and clean design. I ordered it from some guy in the Netherlands. I believe he is starting a printing company (also specialized in arcade art). I wish I had ordered my side art from him as well, as he has the special vinyl with air holes for a good price. But unfortunately I already ordered that from pixartprinting. Will see how that'll work out. Will most certainly add an emulator for that! Is the glass tint affecting the clarity of the monitor? I can imagine it does enhance the contrast? I would say it doesn't affect anything too much. Yes, it's darker so blacks are a bit more black. And by cranking up the brightness you still can see the screen very well. But all in all I don't find it much different than without tint. Do I need to paint the MDF after priming, before applying the side art? Can I use spraypaint for a can after priming (on MDF)? And should I use matte, satin of gloss for the speaker panel? What kind of vinyl should I get as an alternative black for the speaker panel? I ordered some and it looked way too "plastic". Below you'll find my control panel again. I ordered a trackball before I found out it wouldn't quite fit on this control panel (with the servostiks etc.). But as I have a spare control panel I could make swappable panels, so one with the trackball. Would the trackball be too close to the screen? And would it be worth it (need a construction to swap, and don't know where to store the other control panel)? I started painting mine. From what I read it says to paint with gloss so vinyl art will stick to it. I’m using spray paint for a smooth finish. It really depends on what you plan to play. In my first cab I had a trackball but only played Marble Madness once in a while. For the rest I used the trackball for Arkanoid and as "steering wheel" for a handful of racegames. So in version 2, I went for a spinner; and that saved space and it worked better for the majority of the games I actually played. So in all, I recommend to make a list of games you like that actually require a trackball and then decide if it is worth implementing one. Would the trackball be too close to the screen? I'd just try it and find out. Make a quick test control panel with your trackball and play a few rounds of missile command. See how it feels. It looks like there is ~5 1/4" from the center of the trackball to the bezel on a missile command upright, if that helps at all. I guess I will try later on. I bought the trackball for games like Golden Tee or some bowling game, so that's why I'm not sure about the clearance to the screen. But anyway, I got the coin door installed. Have to think about a way to mount the speakers (grill etc.). And then off to painting. It rarely gets used - but its fun to demo for first timers.. Funny part is - showing someone how to use the machine - they take a couple of 'duh' moments to tell them - the game requires a coin.. just like in the 80's.. So put one in or hit the coin button! Is it possible to use your sketch up plans for the cab? I've always wanted to build a cabinet and your design is my favorite from what I've seen on here. Looking forward to more build pics as you progress. Sure, no problem. I uploaded some files to the first post. The SKP's and side art files (without the design) of the most panels. Please bear in mind that the 90 degree corners of the side panels aren't exactly 90 degrees (made a small miscalculation) and the height might be not your personal preference (I also added about an inch (3 cm) at the bottom as I wanted to use leds below the cab). The black button is the shift button. So combined with other buttons it controls certain functions (like volume up and down through the black button combined with P1 up and down, or close shift+start). I didn't want all those dedicated buttons so I decided on this. Thanks! I didn't realize you can control volume through the buttons too, thats really cool. Is that volume feature of the front end you are using? Yes it is. Currently it's a feature of Emulationstation (Retropie), but I am quite confident this will be possible in front ends on Windows though (or as a function of Windows). Oh my god, I hate painting. But we're almost finished... Just one coat of black (I scratched it a bit). Started with art work and I like the look so far. So just some more artwork on the sides, then T-molding. Then assembly and I should be done.